Over the last 15 years, Dave Kindig has been moving up the ranks, gaining a reputation as one of today’s best hot rod and modified ride minds in the world. It’s a reputation that’s been built off of his extraordinary talent and unique vision, both of which were apparent right from the beginning of his career. 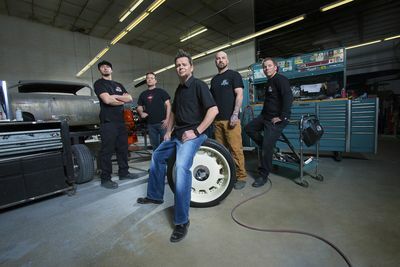 In fact, his shop, Kindig-It Design, has become so popular and respected that Velocity decided to give Kindig his own television show, Bitchin’ Rides. Debuting earlier this year, Bitchin’ Rides was an instant hit and put Dave Kindig in the upper stratosphere of celebrity auto enthusiasts, right along side Jay Leno and Top Gear hosts James May, Richard Hammond, and Jeremy Clarkson. This entry was posted in Culture and tagged bitchin rides, dave kindig, kindig-it design. Bookmark the permalink. What type of wheels are those you put on the Ford Galaxy. Do you sale wheel tire packages.